Beavers had a great time and completed their Musician 1 Staged Activity Badge at the meeting last Tuesday. They shared their own taste in music, talked about songs they already knew, learned about warming up their voices, sang together, in rounds, sing with actions, and even sing different songs in a round. They sang for each other, the young leaders, leaders, and Janet. Well done everybody for showing some amazing listening skills and doing your best to join in. Malak and I were very proud of you all. A huge THANK YOU to Janet for coming in and helping us to learn so many new songs. It was an early start on Saturday for 15 excited Beaver Scouts, as they all had to meet at Riverside Retail Park at 8am – a bit early for a Saturday morning!!!! When we arrived at camp, we went to see where our Cubs had been camping and to have a drink with them before we started our activities. All the Beaver colonies were put into groups, we were with 1st/14th Warrington West and their leader, another Hawkeye!!! (Ruth is also the new Explorer Scout leader for Hawk in Warrington East). We had a timetable of different bases, each lasting 25 minutes. In the morning we started with inflatable human football, followed by team challenge games. 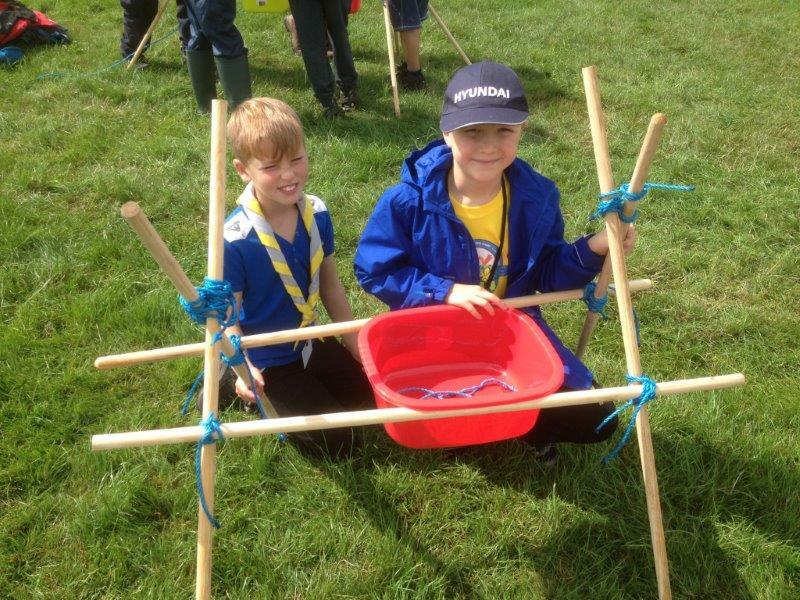 By then all the Beavers knew each other and went off to make campfire doughnuts, followed by a craft activity. Hopefully everybody managed to bring home their pictures / weaving / bookmarks / bracelets home safely. Beavers bounced round on the inflatable pirate ship, before playing the giant games and already it was time for lunch. We moved the tables outside so we could sit in the sun and eat our hotdogs, Eton Mess and biscuits. Then there was time to play games on the field, whilst the District Commissioner talked to the leaders, before we all went back for the afternoon activities. Next was archery and also the chance to visit the site shop and buy huge amounts of sweets! After that was a graffiti wall, under the shelter of the barn and out of the sun which was getting quite hot! We moved onto the next base – Malak & Bubbles tested the inflatable assault course before we went on it. Bubbles won!!!!!! Before we left there, Patrick from 1st/14th made his promise at the top of the slide. Finally, we visited the blind trail before collecting our bags and heading for the coaches home. Thank you to Malak, Mr. Norway, Hawkeye & Bubbles for taking us to visit the camp. 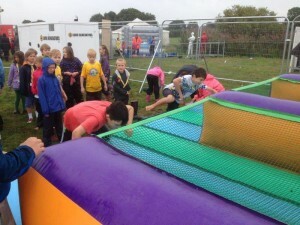 Hope all the Cubs have dried out after the slightly soggy finish to the district camp at the weekend. The downpour didn’t dampen their spirits. Luckily, Saturday had great weather and the Cubs were able to join in with a fun packed programme: archery, rifle shooting, grass sledging, orienteering, circus skills, climbing wall, catapults & slingshots and a brilliant bouncy assault course. On Sunday, our group was the fastest to strike camp, so had plenty of time to make mini-catapults on the pioneering base, play lawn darts & croquet, follow the blind trail (wearing blindfolds), make campfire doughnuts and throw paper planes. 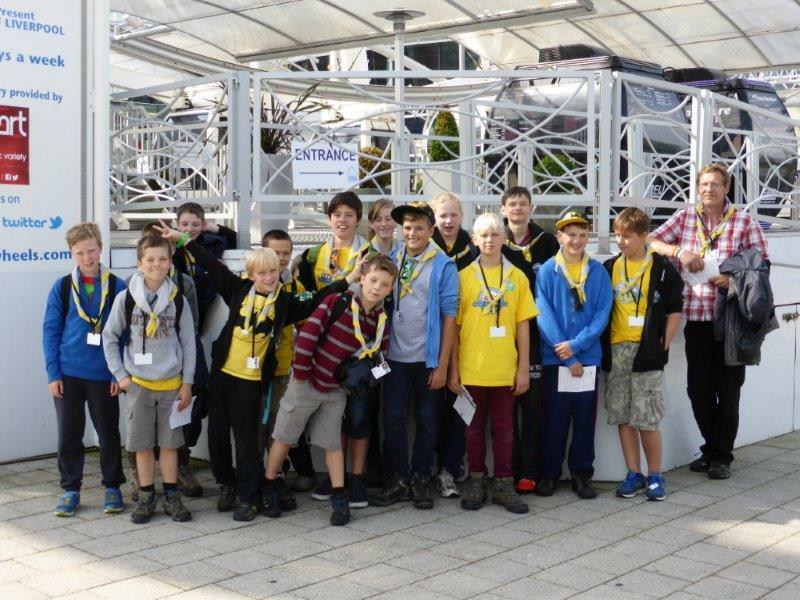 Thank you Akela & Baloo for taking the Cubs to camp. And a huge thank you to Hathi & Kaa for taking the Cubs round all the bases. All eight achieved a Blakfoot Gold for their hike and we’re very proud of them. I was a little disappointed that they weren’t a bit more exhausted when we collected them from Clitheroe, especially after some of the reports I’d heard from the leadership team about how talkative they all were at night-time! How much does it take to tire out our scouts? Thanks again to Ian (aka Ancient Akela) who did even better this year organising fantastic weather for our group’s Family Hike on Sunday 12th October. We all had a brilliant time and enjoyed a great day in each other’s company. 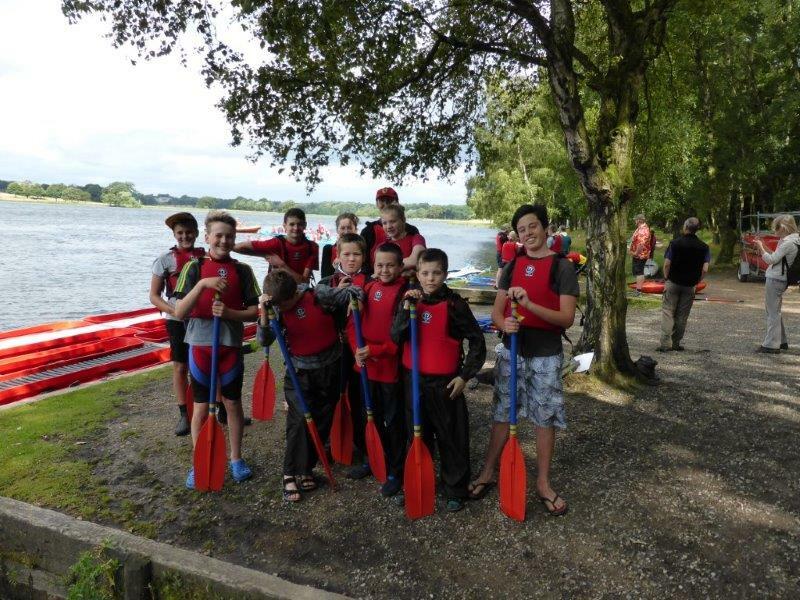 All our sections joined in and even some “Beavers in training” came along and managed to keep up. Keep your eyes out for some more challenging hikes being organised by Ian soon. Chamboree 2014 started on 1st August and finished on the 9th August. That’s eight days of super fun scouting. Within these eight days Cubs, Beavers, Scouts and Explorers visited the site unaware of the fantastic activities prepared for them. There were many amazing zones to rotate through each day. Survival zone (can you survive in the wild?). Each night there was an event such as: film night or the UV disco. This meant that there was never a dull evening. The highlights for me were I.R.I.S. zone, Survival zone and the UV disco. The best activity in IRIS was the washing machine – where we all got foamed, but the zorbs were brilliant fun as well. When we were knocked over, we looked ridiculous with our legs flailing in the air, until the zorb referees turned us the right way up again. Survival was brilliant too. We sheltered from the rain inside a tent whilst we made survival bracelets from paracord. When we emerged, the rain had stopped. Some of us built dens; others made their own tent pegs using saws and knives; some learned how to prepare and cook “wild” food and tasted rabbit and pigeon. All of us played on the giant pioneering carousel. 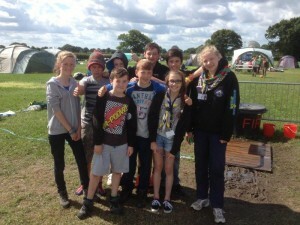 Cubs camped for the weekend at Tabley showground. Fortunately the rain stopped and we all went to the main arena tent for a disco. The grown-ups danced more than the Cubs but the Cubs were better at dancing!!! On Saturday, we did IRIS zone – starting with a bouncy castle filled with foam and small plastic balls, we had to collect as many yellow balls as possible. We had a nerf gun battle, did a Thor hammer throw, a penalty shootout, and an inflatable assault course. We rounded our morning off with a visit to the Circus. The best bit was watching Mike Comber on the aerial straps – he went right up to ceiling of the Big Top and then unrolled himself really quickly down to the floor. Later the clown got some of the leaders to join in with his act and that was really funny. We returned to camp for our lunch with the Beavers – who had arrived that morning. In the afternoon, we visited more zones. We did some CSI fingerprinting in Xperiment; then we climbed over a giant gateway into Survival and played on the swings and carousels. By the time we got back to our camp, the Beavers had left and the Scouts had arrived. We quickly ate our tea and played in the sunshine before parading down to the opening ceremony. Cubs were right at the front near the stage and the music was VERY loud. We joined in with Chamboree X dances and then went back to our camp for hot chocolate, marshmallows, squirty cream and biscuits. On Sunday, the Scouts had to leave early to catch the bus to Tatton, we could relax and have our breakfast in peace before joining the other Cubs for a morning of activities. We could choose whatever we wanted to do. Our Cubs beat the Brownies at Tug of War – even though their leader was helping them; we made amazing rockets that flew a really long way, and tried loads of other games including: circus skills; throwing balls into a bucket; beat the buzzer wire game; laser string assault course; duck, duck, goose; splat; and a superhero training session. After lunch we had some free time to pack up our kit and then just relax in camp. We visited the main arena to buy souvenirs and sweets and then it was time to go back to meet our parents at camp. I can’t wait until Chamboree 2018 when I can join in with all the Scout activities and stay for a whole week and not just the weekend. 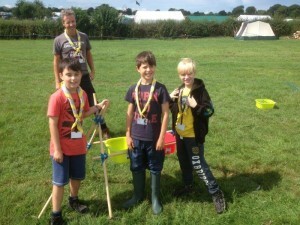 What a brilliant day Beavers (and Rainbows) had at Chamboree on Saturday 2nd August. Hawkeye came with us on the coach; Bubbles and Chip met us at Tabley and showed us where the Cubs were camping. Fortunately, we got there just in time to have a bacon sandwich! Next we went to the main arena for an opening ceremony and then it was straight to our activity zone. In the morning we went to Creative & Faith zones. Apparently it was raining outside, but we were so busy we didn’t notice. We made superhero wings for our trainers; bashed metal spikes into leather keyrings to emboss them; painted our hands and added our prints to a HUGE circle of paper that had handprints from practically all the Beavers, Rainbows and their Leaders; coloured in pictures of superheroes; made Hama bead shapes and bookmarks. We returned to camp for our lunch with the Cubs – who had been on their own activity zones. Lunch was beef burgers with salad, then fruit and birthday cake (one of the Scouts had their birthday at camp). There was a superhero treasure hunt around the site, but we were too busy eating cake to find all the superheroes. In the afternoon, we visited the Indoor Arena where we blew giant bubbles; danced with Vinnie Vole, fired elastic band guns, solved a co-ordination puzzle by working as a team, had a cup relay race, made duck food and played “Hook a duck”, scrambled under a camouflage net, and then did lots of small challenges and games to beat “The Cube”. We rounded off our afternoon with a visit to the Big Top and the circus. Hannah Rose amazed us with her rope climbing skills and the clown made us all laugh a lot. 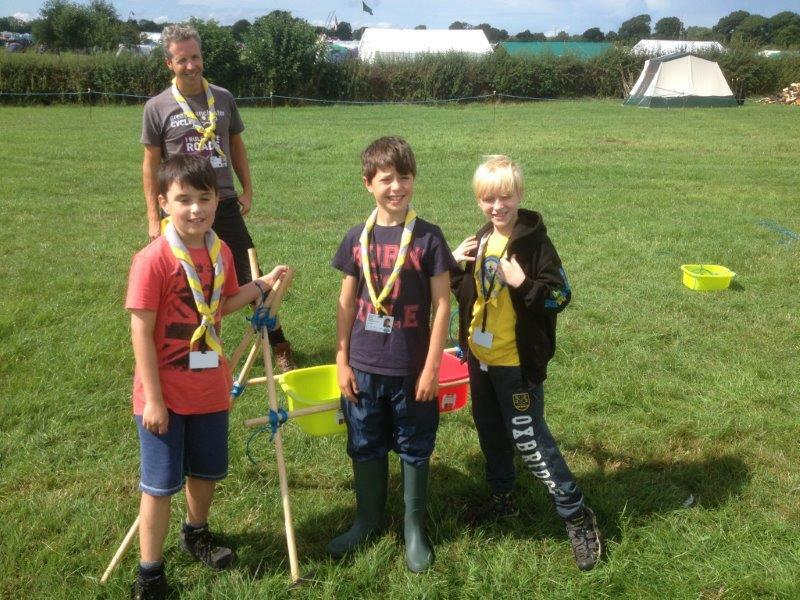 We can’t wait until Chamboree 2018 when we’ll be old enough to join in with all the Scout activities and camp for a whole week. 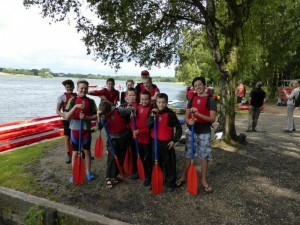 Beavers enjoyed a brilliant meeting in the sunshine at Lymm Dam when they went Pond Dipping. Ranger Tim helped us to identify all the fascinating creatures that we found. We caught: tadpoles (with and without legs!?! ); pond snails, ramshorn snails, water scorpions, caddisfly larvae, pond skaters, water boatmen, water lice, damselfly nymphs and some pondweed. Thank you Tim for helping us. We’ve done one of the brand new Beaver Scout Activity Badges – the Cyclist Badge! Beavers met at the Rangers Hut to cycle their bikes along the track to the field. We started with a talk about staying safe on our bikes and practised fastened on and adjusting our own helmets. Ranger Tim came out to say “Hello,” and to remind us to use our bells if we were passing any walkers. After crossing the road safely, we got on our bikes. Some of us rode more quickly than others, some had really big bikes, some had quite small ones. Lots of parents joined in with us – their bikes were HUGE! Baloo was waiting at the field for us with some drinks and chocolate bars. Our snack gave us just enough energy to race back along the track to meet up with our parents. Well Done to everyone for staying safe and completing the ride. OUTDOOR CHALLENGE (4,5, & 6) Make something using natural things Make something to help animals in the wild Name 5 different animals, what they eat and where they live Please bring an empty plastic bottle - we are building bug hotels! Bring along any natural materials to create a habitat for your bugs. What do different creatures eat & where do they live?